Diva, living in Alaska have recently had the opportunity to buy a cabin for a song. It was a great deal and we are thrilled with the possibilities it presents. Unfortunately the bathroom is in need of a rebuild and I am trying to figure out how I can keep the log cabin feel of the place without sacrificing basic amenities? The big item I am trying to figure out is the bathroom vanity. Is there one that is both modern and outdoorsy at the same time? Help is needed, hope you have some thoughts as I am lost. 1) Wood. The wood used in a rustic vanity is often sets the tone for the entire bathroom. Keeping to colors and textures that demonstrate a “log cabin” kind of feel, will immediately add the rustic look feel to the environment. 2) Cold stone surfaces. Not only can a rustic looking surface like concrete or engineered stone offset any aged look to the bathroom, it provides some solid function to the space as well. 3) Metal surfaces. 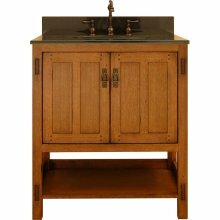 Not as common as other vanity surfaces listed above, this option allows for a really rustic feel, but might lend itself to other issues of cost and maintenance without experience in dealing with such things. 1) Hammered out copper. A fantastic look to be sure, it’s also fairly functional. 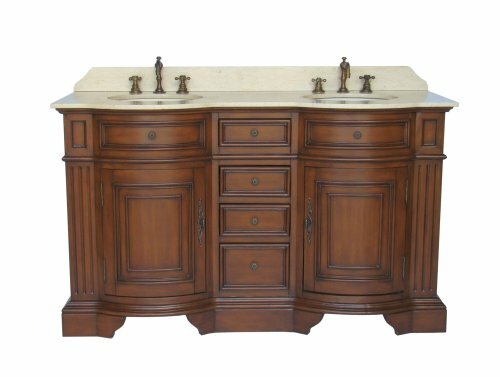 Works well with solid stone or concrete countertop vanities. 2) Ceramic sink. Again, depending on the kind of flow you’re shooting for, this can work well if you are looking for a little more contemporary appearance in this rustic bathroom vanity. Hopefully these ideas will give you a solid starting place for some great Rustic Bathroom Vanity Design Ideas.